This is my first VeganMoFo post for 2014. For more information on this month’s theme, see my Cook from Books description here. I bought my copy of Candle 79 a couple of years ago solely based on the cover, and it has turned out to be just as lovely on the inside as it is on the outside. Named after the famous New York vegan restaurant of the same name, this cookbook is based around the belief that the healthiest food can also be the most flavorful and satisfying. Flipping through the pages always gives me a feeling of welcome, warmth and happiness. Between each carefully crafted page is either a staggeringly beautiful plated and presented dish, an artful display of rustic and fresh produce or everyday kitchen items, shot from a cool or unusual angle. I have to admit, I sometimes pick it up just to look at the pictures, then put it away with inspiration to cook something, even if it’s not from the book. 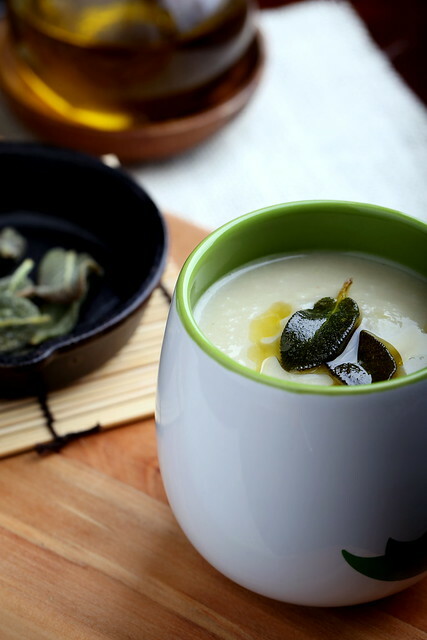 What I was inspired to make from my last look at the book was the Jerusalem Artichoke Soup with Crispy Sage Leaves. Jerusalem Artichokes aren’t from Jerusalem (they are native to the US), and aren’t actually artichokes (they are a member of the daisy family), are also called sunchokes or sunroot, and have an earthy, faintly sweet flavor and look a little like ginger or turmeric. Up until I made this soup, I’d only bought them in small quantities and sliced and served them raw over salads. This recipe uses a lot of Jerusalem artichokes and it was fun to prep and use this ingredient in a completely different way. 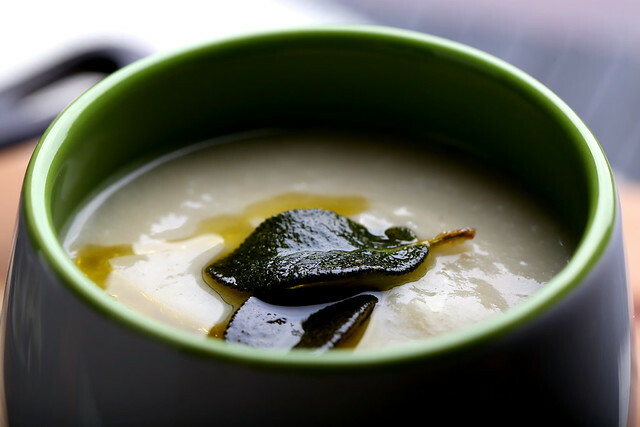 Supremely smooth and silky, with a hint of smokiness, this seemingly simple soup offers complex flavors and releases a beautiful aroma as it develops in the pot. 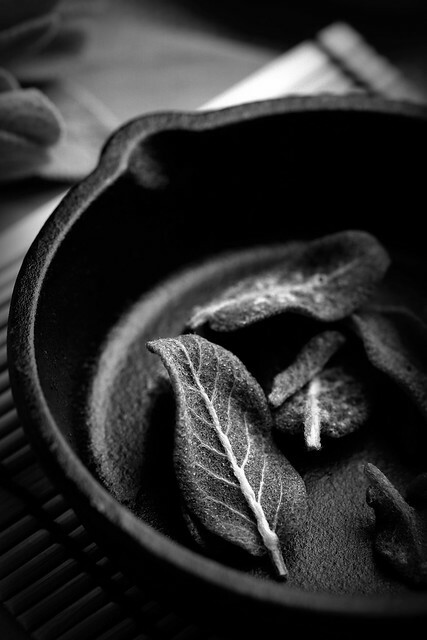 But what makes this soup wholly unique is what it’s finished with—fresh sage leaves plucked from the stem then gently crisped. 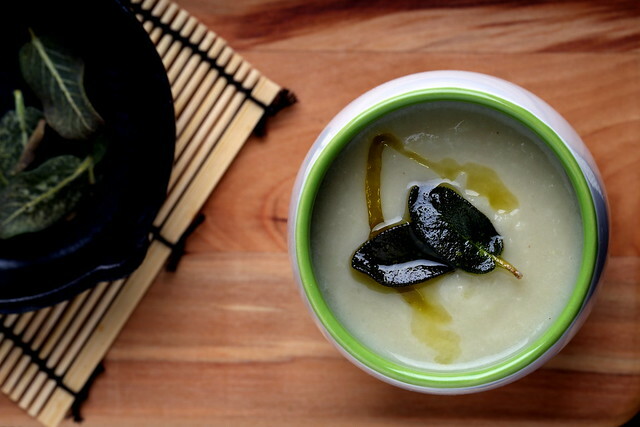 The texture and flavor is a perfect compliment to this beautifully pale green and velvety soup. After I tasted one crispy leaf, I made more than the recipe called for, making sure I had a leaf for every other spoonful. I served it with crusty bread and beer for a simple but gorgeous dinner that made plenty for leftovers the next day. Next up to try is Candle 79’s Zucchini Blossom Tempura (if I can find some blossoms before the season ends), Ginger-Seitan Dumplings, Heirloom Tomato Salad with Macadamia Cheese and Crispy Capers, Wild Mushroom, Asparagus, and Spring Vegetable Crepes, Nori- and Sesame-Crusted Seitan (which is presented on the cover of the book, above) and Saffron Ravioli with Wild Mushrooms and Cashew Cheese. I especially love the balance of decadent and raw, unusual and familiar, rustic and refined that defines the recipes and feel throughout the pages of Candle 79. I also love that it presents a nice balance of quick and easy and labor- or time-intensive recipes. I think that there is a time and place for each, and am always grateful to have a book that presents good choices for both. Whatever recipe you decide to make, you’ll learn something, whether it’s a new technique or ingredient, as well as have a gorgeous dish to enjoy afterwards—and have lots of fun making it. Looks so tasty! I have this book and have yet to try anything from it. I guess I'm a little intimidated but you've encouraged me to give it a shot. Love your theme and excited to see what you make next. Kelly, I love to hear that! I was a little intimidated at first too, but their recipes really are a lot of fun once you start them! so pretty, erin. the soup looks delicious. i love sunchokes so much. Have you ever roasted them?? They turn into these amazing, chewy, caramelized bites of deliciousness. SO good. That said, I also really love them in soup, so this sounds pretty rad. Amey, I have a few sunchokes leftover, so I will try out your suggestion — roasting them sounds divine! I hope you find the zucchini blossoms…we found them at one of our markets and stuffed and fried them. The best once-a-year treat! That looks like a wonderful book! We used to grow Jerusalem artichokes one year but sadly they gave us stomach ache so we haven't had them again. Strangely, the ones from the shops don't do that to me. We've had lots of zucchini blossoms this year though- we made fritters and put them in salads too. I love looking through this book too, and yet, I've never made anything from it! I love Jerusalem Artichokes but they give me the most terrible stomach pain so I don't eat them anywhere near as often as I'd like!